The baby boy that Courtney and hubby Aaron loving call “our little peanut” came into the world 10 weeks too early, weighing just 3 pounds and 3 ounces. 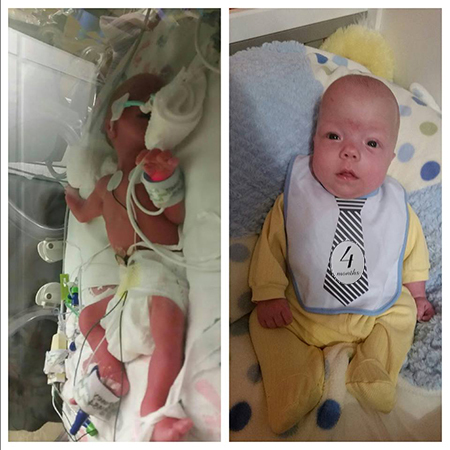 Today he has nearly quadrupled his weight, topping the scales at 12 pounds and 5 ounces. Courtney says the couple’s journey to parenthood began more than four years ago with a cascade of infertility issues and heartbreaks. Ectopic pregnancies caused the loss of Courtney’s fallopian tubes. In vitro fertilization provided under the care of reproductive endocrinologist Meghan Oakes, MD, yielded precious embryos and new hope. Courtney’s pregnancy was closely monitored. At the OB appointment 30 weeks into her pregnancy, Courtney hoped to be told the sudden puffiness she felt was normal and would pass. The examination revealed an additional new symptom: soaring blood pressure. Courtney was experiencing a complication of pregnancy that is life-threatening danger for mother and baby: preeclampsia. 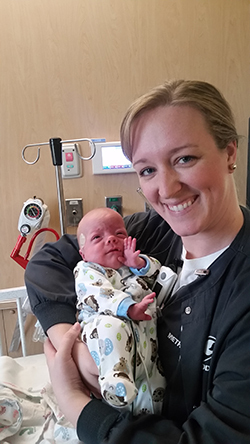 Maternal-fetal medicine specialist Andrew Robertston, MD, delivered little Nnash. Courtney and Aaron, who spent many 12- and 13-hour days at Nnash’s bedside, say they grew close to the NICU staff and remain friends with several nurses. And what’s the inspiration for the unique spelling of Nnash’s name? The Stevensons say it’s all about family tradition and love. Like his dad, Aaron, and his grandpa Lloyd, little Nnash has been given a double-letter blessing from those who love him most.